The Piano Tiles 2 Android game is the next version of the most popular rhythm piano playing game “Do Not Tap the White Tile.” With millions of players around the world, and with improved gameplay, high quality sound systems, and a sophisticated integrated world competition mode, Piano Tiles 2 will surely give players an extremely interesting challenge. By playing the game of Piano Tiles 2, players will become a digital pianist, and personally hit the keys for songs available to any and all tastes. The rules of this game are very simple: players only need to press all the black keys that appear on the screen quickly and follow the rhythm of the song in order to complete each round. 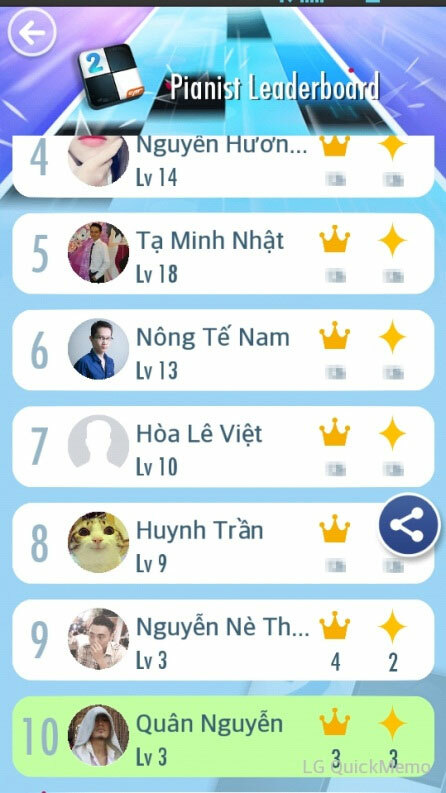 In Piano Tiles 2 android, many famous tracks appeared from around the world, including Pachelbel’s Canon in D, Mozart’s Rondo Alla Turca, and Beethoven’s Moonlight Sonata..
Players are allowed to select music to play, and can also increase the level of difficulty in the game as well as the amount of prizes. Conquer the game by gaining a high score and unlocking the new songs. The melodies in Piano Tiles 2 will be played repeatedly, and the white and black keys will appear constantly. Therefore, players need to be flexible and quick in observing and manipulating the hands and the eyes. It is important not to lose track of any of the black keys as well as avoiding touching the white background. Piano Tiles 2 for Android has 3 levels of play for players to choose from, including Beginner, Senior and Master, so it’s not difficult for beginners to have fun right away experiencing this fantastic game. Simple gameplay: just touch the black tiles and avoid the white tiles. No registration required, players just need to install the game on their Android phone and start experimenting. Sync game data on multiple devices when registered to Google Play. Piano sounds are charming and very realistic. Various subjects and colors instead of just has black and white as before. A collection of diverse music and add other options. Share your music to your friends via social networks. Optimize for high resolution screens. Download Piano Tiles 2 to play and shine like a true artist and share with your friends!